This document will describe how to deploy Ubuntu® MAAS supporting some Windows features. This should be the case for all other hypervisors as well. Also, if using KVM/QEMU make sure that the block device controllers are IDE or SATA, unless you have bundeled virtio drivers when creating the PXE installation media. Ubuntu 16.04 Server w/ two NIC's (1 external, 1 private). The external is connected to the internet, the private will be used for MAAS deployment. Ubuntu doesn't come with the standard naming interfaces like eth0 eth1 anymore instead you will see ens3 ens9 because of systemd renaming those. Let's assume the ens3 is the primary one and ensp5s the second one. 1 NIC (external) Important: Machine 2 will need network acces to the Machine 1 samba server. Configure one of the NIC's to be connected on the MAAS private network. The BIOS/EFI has to be configured for network boot. Note: This will add the current MAAS distribution. shows the IP address of ensp5s (managed NIC), if not set it to 10.10.10.10! Add the following lines to one of your startup scripts. For most cases, /etc/rc.local should do. Head to http://<maas-server-ip>/MAAS/ and test if the MAAS webpage loads. 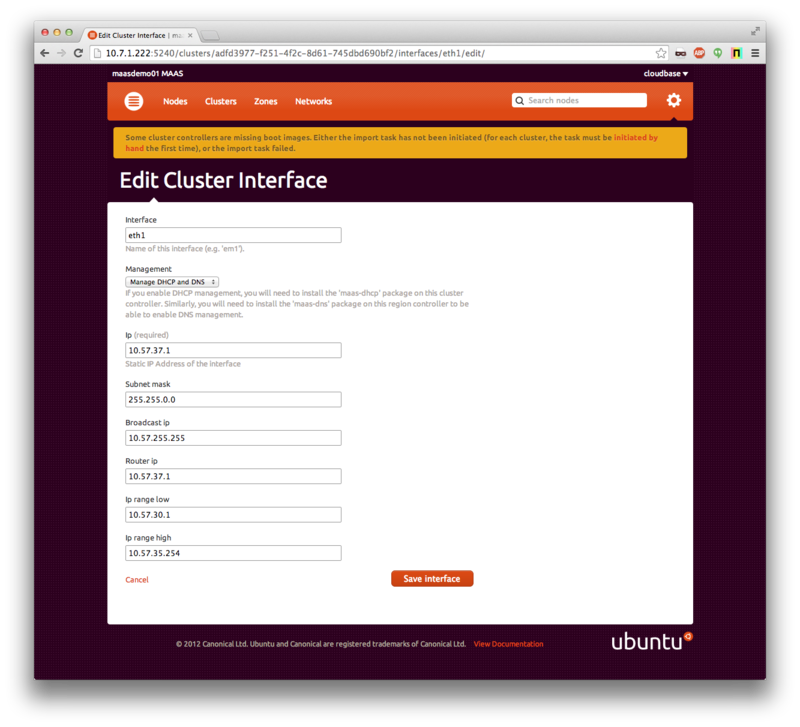 Edit the default cluster and enable DHCP and DNS on the interface where you will be serving DHCP (see the screenshot as an example). Open http://<maas-server-ip>/MAAS/clusters/ in a browser; ens9 is most probably the one that needs to be configured. If you want to use ssh you'll need to generate a ssh key pair for the maas user. By default there is no home directory created for the maas user. Your identification has been saved in /home/maas/.ssh/id_rsa. Your public key has been saved in /home/maas/.ssh/id_rsa.pub. Open http://<maas-server-ip>/MAAS/account/prefs/sshkey/add/ and paste the contents. Create a x509 certificate to use with WinRM. This command is available on the MAAS node itself. Open http://<maas-server-ip>/MAAS/account/prefs/sslkey/add/ and paste the contents. For the moment, this only works on Windows. Please follow the inscructions detailed in the README of the above repo. There will also be an image builder that works on linux as well provided by the MaaS team. Stay tuned. At the moment the tools necessary to generate these images are not public. There will be a linux version of the tool available soon, and we are working on getting a windows version as well. This page will be updated as soon as they are made available.